!! FROM THE NORTH !! Take I-95 to Exit 133A (Business)Falmouth….. This is Route 17 South…. Continue a couple of miles (4 lights) until you hit Route. 1 (4th light)…. Left on Princess Anne St.(Your first light)….travel through 4 lights…. Eyeclopes / Everybody Drum will be on the Left Side. Eyeclopes Studio & Gallery 620 Caroline Street. !! FROM THE SOUTH !! About 3 blocks down make left on Charlotte Street. Eyeclopes / Everybody Drum is on the right side, two blocks down. 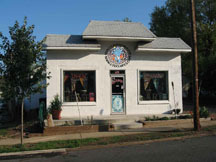 Eyeclopes Studio & Gallery 620 Charlotte Street.